This is the first game in the Double Dragon series. For other games in the series see the Double Dragon category. For the NES game, see Double Dragon (NES). For the Game Boy game, see Double Dragon (GB). For the Neo-Geo one-on-one fighter, see Double Dragon (Neo-Geo). Double Dragon (ダブルドラゴン, Double Dragon?) is a 1987 beat 'em up developed by Technos Japan and distributed in North America and Europe by Taito Corporation. The game is a spiritual and technological successor to Technos' earlier beat 'em up, Nekketsu Kōha Kunio-kun (released outside of Japan by Taito as Renegade), but introduced several additions such as two-player cooperative gameplay and the ability to arm oneself with an enemy's weapon after disarming them. 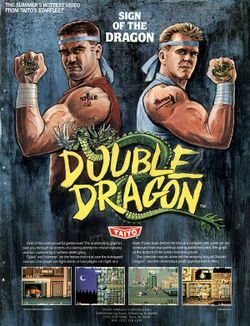 Double Dragon is considered to be one of the first successful examples of the genre, resulting in the creation of two arcade sequels and several spinoffs, as well as inspiring other companies in creating their own beat 'em ups. The player takes control of martial artist Billy Lee, or his twin brother Jimmy, as they fight their way into the turf of the Black Warriors gang in order to rescue Marian. The player character has a repertoire of martial art techniques which range from basic punches and kicks, to more elaborate maneuvers like hair grabbing moves and elbow strikes. There is a small variety of enemy characters that the player will face thorough the course of the game. Certain enemies will carry a melee weapon which the player can use by disarming the enemy carrying it and then retrieving the item from the floor. The game is divided into four different stages or "missions". The game normally ends if a single player defeats the final boss alone. However, if two players manage to complete the game together then the two will be forced to fight each other in order to determine who will win Marian's affections. Home versions of the game were released for the NES, Sega Master System, Atari 2600, Atari 7800, Atari ST, Amiga, Commodore 64, Game Boy, Genesis/Mega Drive and Atari Lynx, among other platforms during the series's height of popularity. A remake titled Double Dragon Advance was released for the Game Boy Advance in 2003. The NES version was re-released for the Wii's Virtual Console in North America on April 28, 2008 at a cost of 500 Wii Points. Nintendo also released the Game Boy version on the Nintendo 3DS Virtual Console in 2011. Another remake has been released for the iPod Touch/iPhone mobile devices, which features brand new gameplay, sprites and animations, and music. The game follows the story of Billy and Jimmy Lee, twin brothers who learned to fight on the cold, tough streets of their city. Their expert knowledge of the martial art Sou-Setsu-Ken, combined with their streetwise outlook, means that they're two of the most formidable combatants ever to walk the streets. But now Billy and Jimmy are faced with the greatest challenge they're encountered. Billy's girlfriend, Marian, has been kidnapped by the Black Warriors, a barbaric street gang headed up by Big Boss Willy. Use whatever weapons come to hand - knives, whips, bats, rocks, oil drums, even dynamite! Take control of Billy and Jimmy as they pursue the gang through the slums, factories, and outskirts of the city to reach the gangs hideout for their final confrontation with Willy. This page was last edited on 2 December 2015, at 21:06.